Formerly plan code 24-001. Check out our video below! 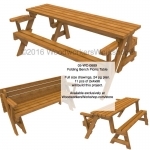 Our folding bench picnic table is made entirely with standard 2x4 lumber. Simple and easy to build. Adjust the length to suit your needs. We show ours to be 72 inches long (183 cm). Length can be adjusted to whatever you want it to be. Tools needed: At least a jig saw, a drill and other common workshop tools. The purchaser of this pattern is granted permission to make one to five copies of this project for personal use and to sell at craft shows. Permission is required to make more than five finished parts of any section of this pattern. Any other use of this pattern, in whole or in part, like making kits from pre-cut templates, mass production or commercial usage, is strictly prohibited and will not be tolerated. Customers wanting to build and sell more than we allow of this project must first obtain permission from us. (More on why we are so concerned about copyright.). Did a search and found your plan. Just completed the project. Everyone loves it. I think I will be building a few more. Thank you for the plan. Can't wait to start building.